We will not release any keys before 8:00 am on August 18, 2017. Our office will be closing on this day at 7:00pm and no move-ins will be allowed after this time. Check-in will be located in the clubhouse and directional signage and staff will be on hand to direct you where to go. As you are probably aware, there will be a large number of students moving in on this day. In an effort to keep things running as efficient as possible, it is necessary that we assign times for everyone to move-in. Please find listed below a quick reference guide for move in! *PLEASE NOTE THAT APARTMENT AND ROOMMATE ASSIGNMENTS ARE SUBJECT TO CHANGE. IF A CHANGE IS NECESSARY YOU WILL BE NOTIFIED IMMEDIATELY. Rent: Your monthly rental installment. You will owe a full installment of rent on August 1, 2018, which will cover your August 2018 installment. August rental payments must be made with a personal check, cashier’s check, or money order. WE DO NOT ACCEPT CASH. August payment can be mailed. Your next installment will be due on September 1, 2018, and then on the FIRST of each month after that. Rental payments can be made with a personal check, cashier’s check, and money order. WE DO NOT ACCEPT CASH. You can mail in your check or money order. You will also have the option of paying online with a credit card or electronic check through The Landing website and click on Residents. This can be set-up as a one-time payment or a recurring monthly payment on the first. When logging into the resident portal, it will show a zero balance. Please manually enter the amount listed above and make the payment to prepay the account. *** It is vital that you let us know your apartment number AND bedroom letter when you pay! Have a question? Don’t Worry! We’re here to make your life as easy as possible. Check out some FAQ’s. 1. What size are the beds? All beds are full extra-long! Queen size sheets fit best. Bathroom Accessories-Shower Curtain, Towels, Plunger, etc. 4. What appliances are in my Kitchen? 5. Will you send me a bill each month for rent? Rent is due on the 1st of every month for each resident. Because rent does not change and is always due on the first of the month we do not send out a bill. 6. How do I pay my monthly rental installment? Payments are due on the first day of the month. You may pay the rent at The Landing office or take advantage of one of our online options detailed below. 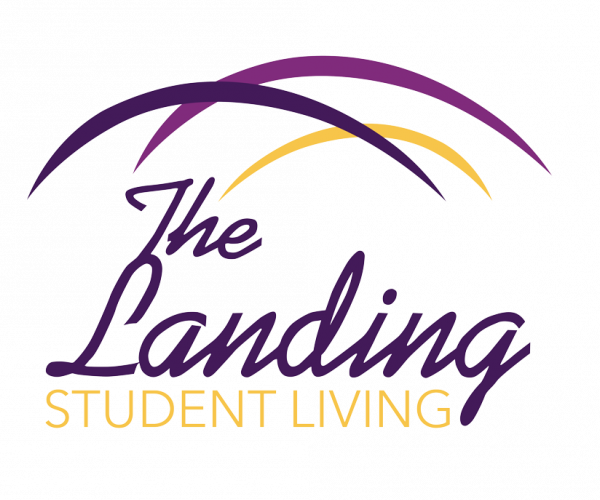 You may pay your rent online by credit card or eCheck at The Landing and select the “Residents” option. You may pay your rent by check, money order, or cashier’s check at the office. If your rent payment is received after 8:00 am on the 6th day of the month you will be charged a late fee as stated in the lease agreement. Payments may be made after hours by dropping off your check, money order or cashier’s check in the night drop box located across from the fitness center. Be sure to include your name and unit number on the check, money order or cashier’s check to ensure timely processing. If late charges are applicable, they will be assessed to your account and/or the payment returned. We reserve the right to refuse any payment that does not pay your balance in full. 7. What utilities are included in my rent (All-Inclusive Only)? We take care of all of the utilities for our residents! This includes an extended cable package, internet, sewage, trash, water, and electricity! 8. Do I need to bring window coverings? All windows in your apartment are furnished with blinds. You may add curtains. Only small nail holes are permitted. NO sticky tape, sticky tack or adhesives are permitted on any walls in your apartment. Use of these items will result in charges. 9. What do I need to hook up my computer to the Internet (optional)? All that is needed to connect to the Internet is an Ethernet cable which may be purchased at most electronic stores. That’s it! You can also connect via Wi-Fi without an Ethernet cable. The property has a wireless overlay for your enjoyment and use. 10. Can I bring my own bed or other furniture? If you would like to bring some of your own furniture that is fine. If you would like to remove a piece of our furniture, please contact the office and verify in writing what you want removed. 11. Where do I park? Where do my friends park? If you have a parking sticker you can park anywhere on the property except under covered parking spaces. Covered parking spaces are available only to those residents that pay for parking per their lease agreement. Upon move in to the community you will register and receive your parking sticker. If you get another vehicle, just keep the same parking sticker. However, please make sure you register the new vehicle! A replacement parking sticker is $50. Guest parking is available in the designated visitor parking spaces. 12. Can I bring my bike? Once again, thank you for choosing The Landing as your new home.